In my third year of training I was on clinical placement in the recovery unit where I helped to care for a trans patient who had undergone a bilateral breast augmentation. The patient, who identified as female, seemed very anxious on admission to the unit. She had a history of mental health issues, including severe depression, body dysmorphia and self-harm. Although caring for patients who are trans was relatively new for me, I had recently attended a lecture at university about improving care for this group. The lecture focused on the need for healthcare professionals to consider the thoughts and feelings of trans patients, and the actions staff can take to help improve their care experience. A patient who was transitioning from male to female had been invited to speak to us about her experience of being trans in a hospital environment. One of the main issues she highlighted was how a lack of understanding of the needs of trans patients, and how to approach them in the right way, could harm patient care. This included staff using the wrong pronoun, despite a patient having specified their preference, and staff appearing to avoid trans patients because they didn’t know what to say to them. The speaker felt staff were awkward in their interactions with her, and she had heard some say identifying as trans was attention-seeking. 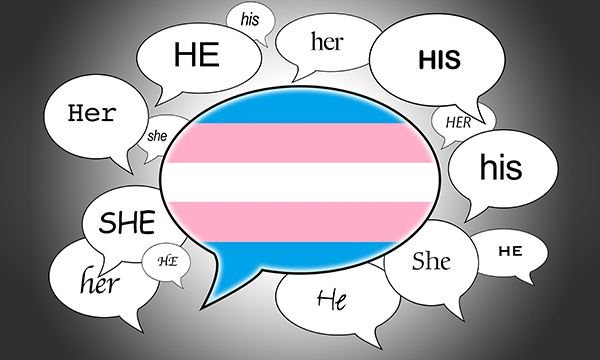 Factors that could have improved her experience included using the individual's preferred pronoun or addressing them by their preferred name, taking the time to listen to what is important to the patient and not being afraid to ask questions. The insights from the lecture enabled me to take small but important actions when caring for my patient, such as using the correct pronoun and actively listening to her concerns. I empathised with this vulnerable patient and wanted to ensure she felt as comfortable as possible. Person-centred care was the focus; I wanted her to feel safe and respected, and to know that her gender identity made no difference to my behaviour towards her. As I built up a therapeutic relationship with the patient, she began to relax. Her body language became more open and she seemed calmer, smiling while I asked questions and we talked about her needs. I consider myself to be a highly compassionate nurse and hope I go above and beyond for every patient. But this patient was particularly vulnerable, and I was determined to do everything I could to make her hospital experience as positive as it could be. On discharge from the unit, she held my hand and thanked me for making her feel so involved in her care, and for making her feel safe. I treated her exactly the same as all the other patients in the recovery unit, and when she thanked me for accepting her for who she is, I felt a sense of accomplishment. Once the patient was transferred to the ward, I spoke to the other nurses and support staff on the unit about caring for trans patients. Most of them had not had much experience in this area, and their main fear when communicating with trans patients was that they would say the wrong thing. The nurses also said they didn’t know enough about caring for these patients, and that receiving the relevant training would improve their knowledge and the patient experience. I explained that the best way to care for trans patients was to treat them the same as any other vulnerable patients; actively listening and understanding what is important to them, involving them in decisions about their care and always considering the patient’s perspective. Understanding patients’ experiences and feelings is crucial if we are to deliver outstanding care and support to all patients. As nurses, we will always be presented with challenging situations, or areas of care we do not know enough about. But an essential part of learning new things is to listen, and we must not be afraid to ask questions, even if this makes us feel slightly awkward. Proactively enhancing our knowledge will create the best patient experience and help ensure we deliver the high-quality care our patients deserve.